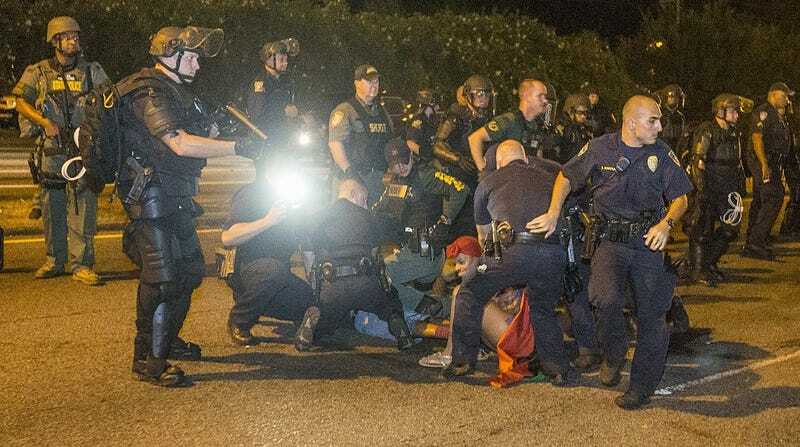 Police arrest protesters on July 9, 2016 in Baton Rouge, La. Despite the fact that five police officers were killed in Dallas on Thursday, protests over the deaths of 37-year-old Alton Sterling and 32-year-old Philando Castile, two black men killed by police in the last week, continued across the nation throughout the weekend. From London and New York City to Detroit, Washington, D.C., Atlanta, Baltimore and Baton Rouge, La.—where Sterling was killed—and St. Paul, Minn.—where Castile was killed in a suburb—many exercised their constitutional right to peaceful protest as well as civil disobedience, snarling traffic in major cities. On Saturday, especially, some of the protests got heated and resulted in arrests, especially after protesters shut down major highways. In New York City, 40 were arrested; in Baltimore, four were jailed; in Atlanta, at least 11 went to jail; and hundreds more were booked in Baton Rouge and St. Paul, according to ABC News. On Saturday, in Baton Rouge, scuffles between riot police and Black Panther activists, some of whom carried shotguns, resulted in mass arrests. Louisiana law allows for weapons to be carried openly. After a short standoff later in the evening, riot police arrested as many as 30 demonstrators and recovered weapons, reports AOL News. Prominent black activist and former Baltimore mayoral candidate DeRay Mckesson was among those arrested. Moments later, someone shouts, “This is the police, you're under arrest! Don’t fight me! Don’t fight me!” McKesson responds: “I’m under arrest, y’all!” before the camera is knocked to the ground. The Advocate says that Mckesson texted Washington Post writer Wesley Lowery with news of his arrest, saying that he was arrested with 33 others, but later reports confirm that hundreds were taken into custody. #FreeDeRay was trending on Twitter on Sunday morning.